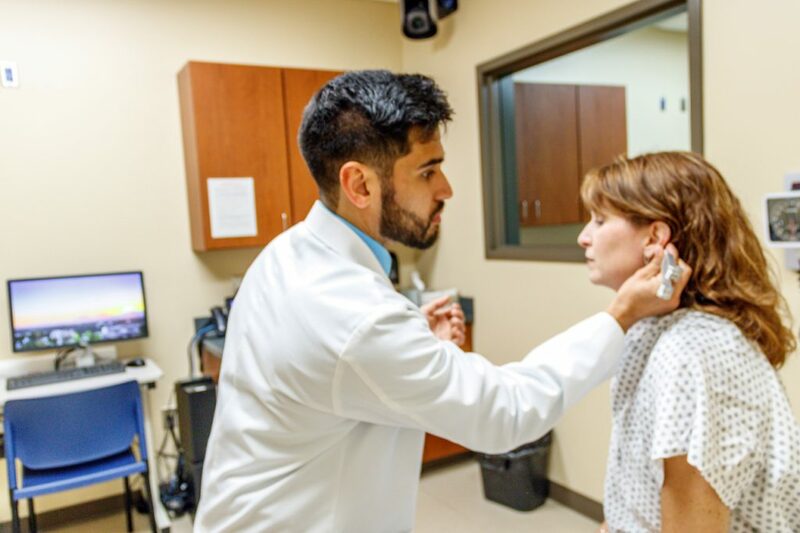 Before internships and residencies, before board exams and licensure and before treating a single real patient, student-doctors at Liberty University College of Osteopathic Medicine (LUCOM) work with actors who simulate patient behavior. These actors are called standardized patients, and they grade how students make them feel and what nonverbal cues or tics a student should change. 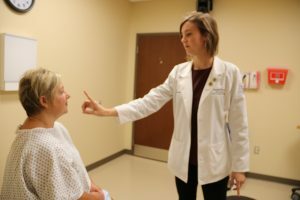 Alonna Brumbaugh, a first-year medical student from Pennsylvania, met her first standardized patient on a Tuesday afternoon in early September. Wearing a dress under her lab coat and stethoscope, Brumbaugh stowed her bag in a locker and swiped into the standardized patient lab. After a brief meeting Brumbaugh waited at the door of her assigned room. When instructed by overhead announcements, she opened a manila folder with her standardized patient’s invented name and date of birth. Another overhead announcement directed her to enter the room. Each encounter room looks like the exam room of an average doctor’s office, complete with a vinyl covered exam table and rolling stool. Brumbaugh had practiced in these rooms with friends. She had rehearsed her interview, memorizing the questions she would ask. The new element was the stranger behind the door. Standardized patient encounters teach medical students a variety of skills. Students interview, examine, and sometimes order tests for each patient. They then step out of the room to type up notes and return for three minutes of feedback. Time limits on the encounters get stricter as students prepare for board exams. Faculty members assess students’ physical exam and interview skills while standardized patients give feedback on nonverbal cues. A doctor who sits too close, fiddles with clothing, or rushes questions can make a patient uncomfortable. If necessary, standardized patients get feedback, too. Each exam room comes equipped with two video cameras and a one-way mirror. From behind the mirrors, supervisors and faculty members watch in a narrow hallway lit by tiny red aisle lights. Pam Watson, assistant director of the Center for Standardized Patients and Simulation, can monitor video feeds from the control room. With other supervisors, Watson makes sure standardized patients follow their training, giving consistent, correct scenarios to each student. Dr. Raena Pettitt, an osteopathic physician and an assistant professor of Family Medicine, trains students and helps design standardized patient encounters. She said some students worry standardized patients will try to mislead or trick them. Watson said the opposite is true. Standardized patients sometimes need reminders not to give students all the information right away. “We want the students to learn to ask the questions,” Watson said. Kim Hartless is a mother of three who works as a standardized patient for LUCOM. She said the responsibility of giving every student an equal experience weighs on her and sometimes she wants to give students a hug. Hartless said she sticks to her script but prays for students before they enter her exam room. Heather Schonfelder, another standardized patient, said she wants students to feel the encounter is real. That takes knowing her material and committing to each role. As Brumbaugh interviewed her patient, she said her preparation paid off and a rush of excitement swallowed her nerves. Later Brumbaugh reviewed the video of her encounter, getting more feedback from students and faculty. She noticed a need to give patients more time to respond and ask questions. Brumbaugh will have several chances to improve standardized patient interactions during her training at LUCOM, starting with her next encounter in November.